Above: Conditioner holder with lid. 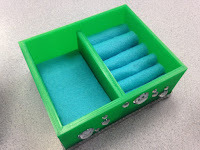 Challenge: For students to produce a container/packaging for a classroom created business project. The container needed to be able to hold liquid or cosmetic products. Background: This is the final draft print of the classroom set designed described previously. 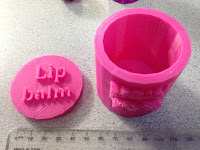 In these two examples students were looking to create containers that would hold samples of conditioner and lip balm. (the cosmetics were to be produced seperately in the classroom and this is the sample box). to be dropped into the base to seal the container. Level of Difficulty: Medium - the issue consistently with this set of designs and prints was the lid. The two lids in the case of both of these prints were no exception. In both cases students had designed the lids without due consideration for a reduced inner lid which would allow the lid to drop into the base. In the case of both of these designs students are going to re-design the lid and drop down the size of the lid insert so the base will work with the lid clearly in place allowing the concept to be successfully completed. 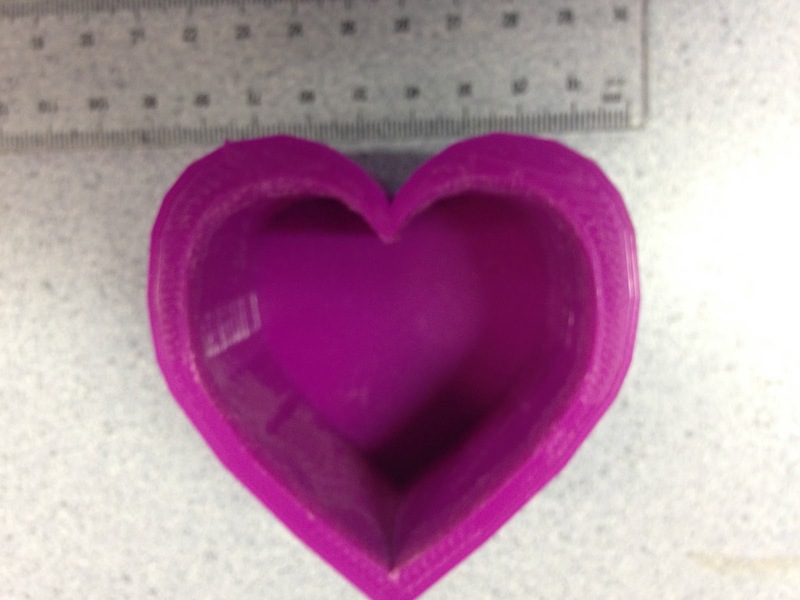 Timeframe: The heart shaped box was two and a quarter hours, the taller box featured above was five hours (both print time included the lids both printed at the same time. This was on the normal print setting, with additional rafting to support the inserts. 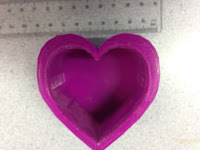 Size: Right - the heart shaped box has a width of 6cm across a height of 2cm, the lid being slightly smaller. The larger container had similar dimensions with the exception of the height which was 8cm. The width of both prints were 5mm and was above right from a size perspective. What would we do differently: The boxes/containers need to have the lid reprinted because with nearly all other objects in this set the students underestimated the need to reduce the inserts allowing the lid to drop into place. The students as noted are going to redesign the lids and re-print them reducing the inserts, the bases are remaining, so overall the prototype succeeded in meeting the breif. Above: Rounded Lip Balm Design. Challenge: For students to produce an original working container that was suitable for holding liquid or lip balm. Created by Y4/5 students in New Zealand who were nine and ten years old. Background: Next term our cluster of four schools have a showcase where the students have worked this term on a significant project. The class next door are making authentic products to showcase and as a result the students used Tinkercad to create a container for their product. Level of Difficulty: Medium - both these designs needed significant adjustments which the students will repeat. Both included text and design that were printed on the outside of the 3D Print, which contrasted with designs that have the lettering inserted into the base of the design. These desings in addition were round in shape instead of being square. When 'rafting' was removed the lettering itself would be removed from the shape, negating its effect. 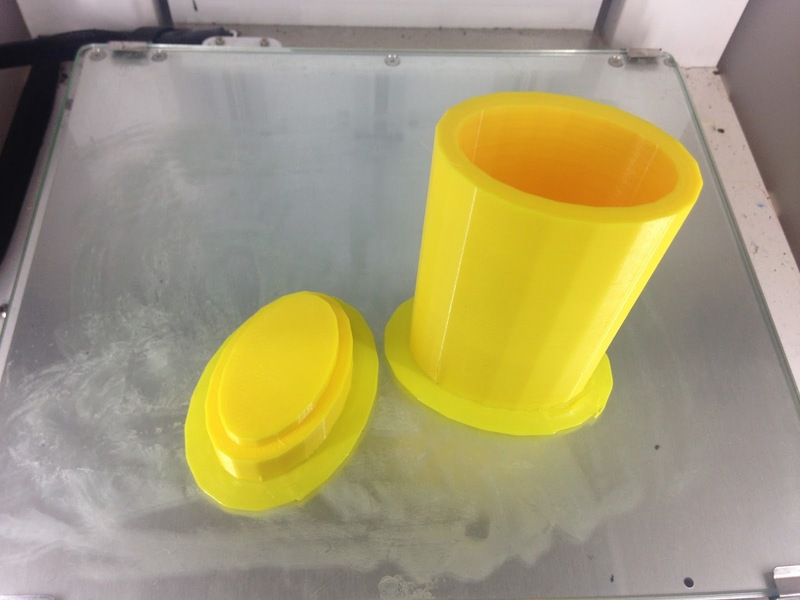 Timeframe: For producing something such as this with an 8mm nozzle (various designs are shown all with slightly different timeframe) you are looking at a six to eight hour print time. The prints are essentially variations of the same theme which is why I have group them all together in a similar post. As a consequence these prints for various reason will be reprinted shortly. Size: As above and shown in photograph. The lids are in the 4cm to 6cm range, the base have a range from 6cm-10cm with a height in the range of 10cm to 20cm. What we would do differently: The lettering will be redesigned to reflect the size of the prints - and an attempt to shift the lettering from featuring on the outside of the print to the inside. This is illustrated in the print to the left which the lettering is starting to show signs of missing parts of the font. We used an 8mm nozzle for this print, on reflection we could have shifted to a 4mm nozzle and this would have allowed more detail into the print - however the problem would have been that this would have doubled the print time and there are a number of prints in this run for the class of students that need to be completed, and this afterall is a prototype to test the production skills of the student and allow them a first attempt at 3D Printing. Heart Shaped Box viewd from above. Background: This is the second featured print from the series previously described here. 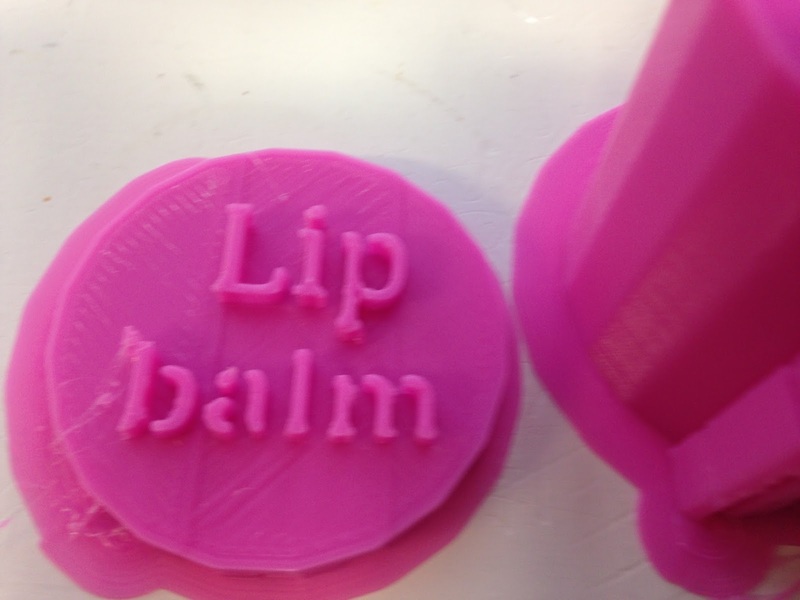 The idea was for the student to produce a product that could be marketed to the general public and this is a test pot, featuring the lip balm with the logo of the business allowing people to sample the produce. 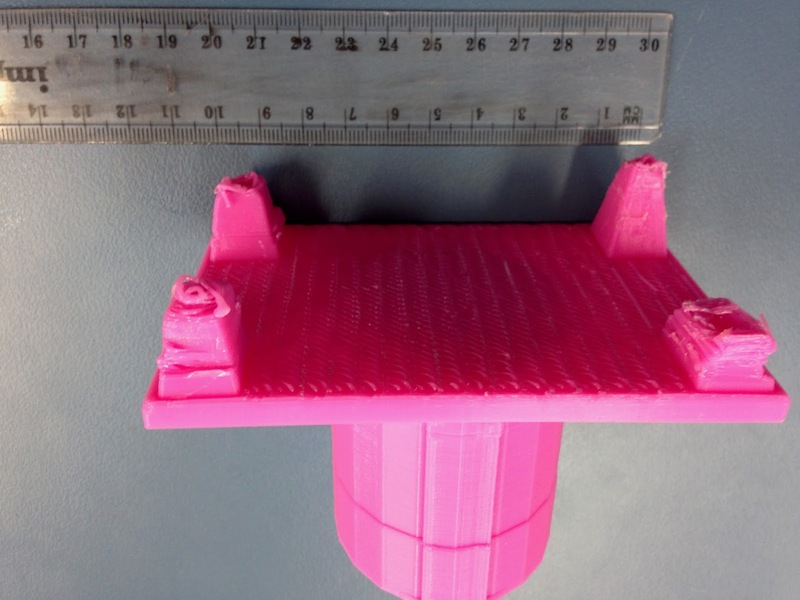 Level of Difficulty: Medium - although the print is not significant in size the design featured a working lid that was required to be printed seperately and work together in conjunction with the base. This required a drop down lid with an insert/lip that would allow it to sit ontop of the base. 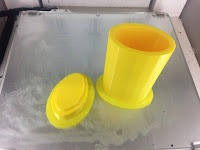 The print was successfully completed with the base the first time. The lid when the 'rafting' was removed (by the teacher with pliers) an adjustment needed to be made with the insert as it required a further layer of removal, this was completed by the parent of the student who designed it, in his workshop at home. (Had this not been possible we would have simply reprinted the lid with an decreased 'lip' insert which would have been in the one and a half hour to two hour timeframe). 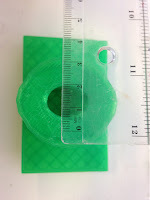 Timeframe: Eight hours - 8mm nozzle size, with standard PLA. 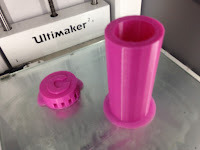 The process was completed by a Tinkercad design followed by a conversion to Cura (the new updated version) and then printed. Size: Both designs were printed 1cm high, a height of 9cm and 6cm across. The idea was that they would sit in the hand of the person holding them. What we would do differently: The students have produced something that has solved the brief in a really positive experience for the students. 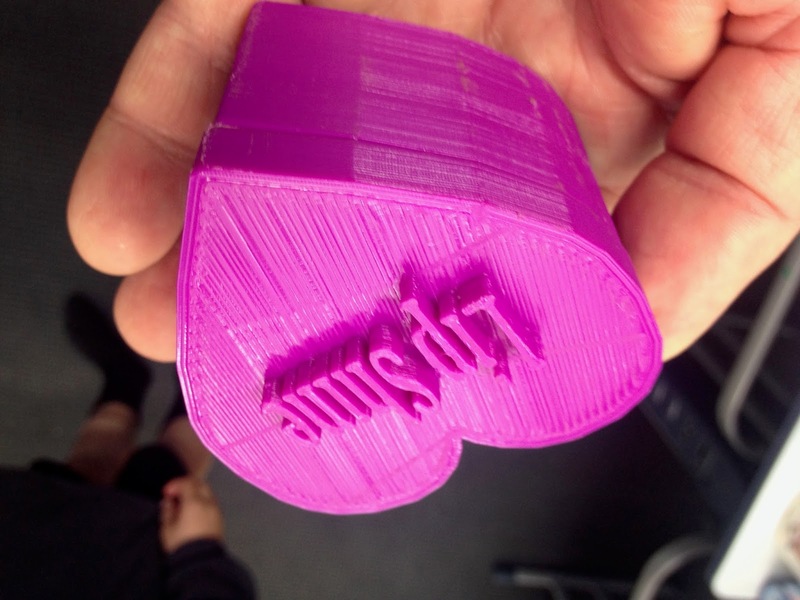 They were able to design and create an original Tinkercad project which then translated extremely well into a 3D Print. 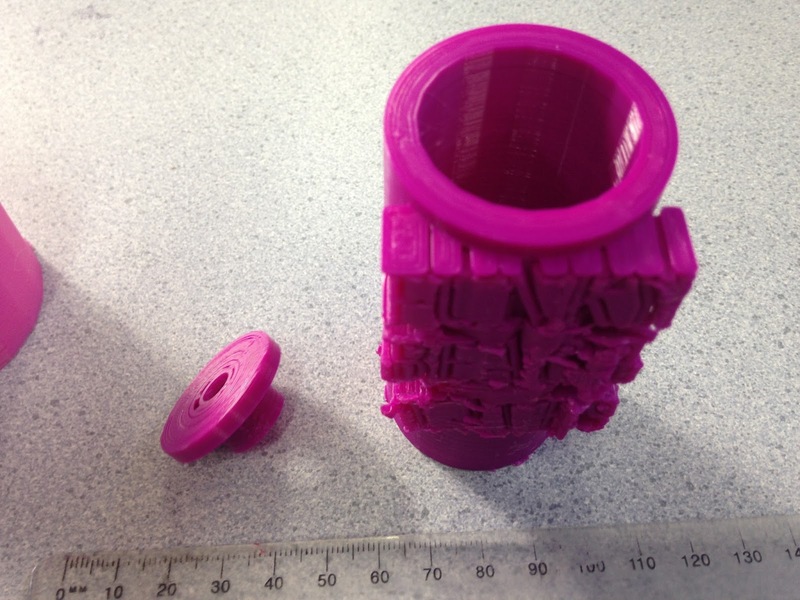 It was the students first experience with 3D Printing and has allowed an original eye catching prop to be completed for their presentation. 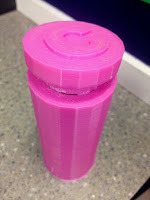 Challenge: For student to create and print a unique personalised container that was suitable for the holding or storage of liquid (conditioner). Background: All of our students have a significant showcase coming up. As part of this the students in the classroom next door are producing a range of products that are unique which they create which they would like to brand. 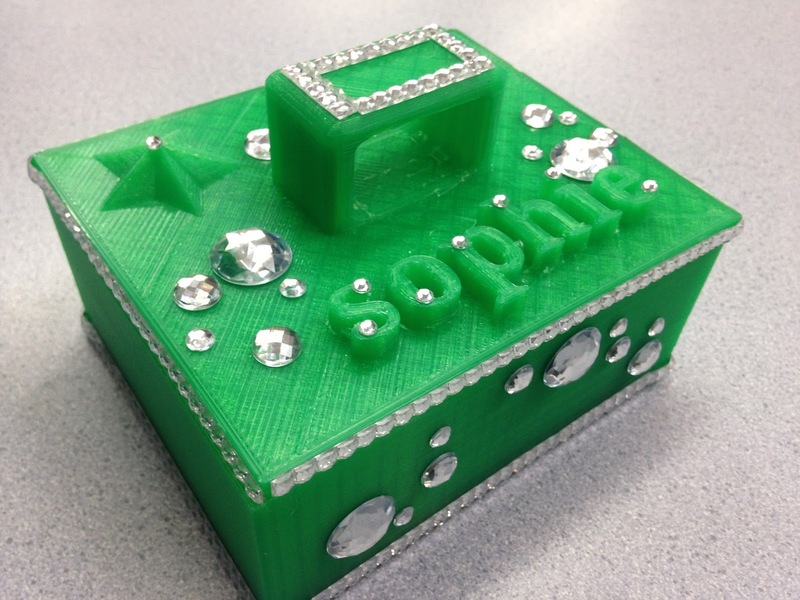 3D Printing allows them to engineer and design their own products (using Tinkercad) and then create them. The students in this case are nine and ten year old students. Level of Difficulty: Medium. The students were designing for the first time and were able to have students assist the process who had 3D Printing experience. There had to be a re-print of the lid as, as the drop down aspect of the first print did not work. It did fit however the fit was extremely tight and wouldn't have been easily removed. The student was made aware of this issue and created a second lid, which was a seperate print, the internal aspect of which fitted much better for the purpose of the print. Timefame: Ten hours for both the base and the lid in this case. The second reprint of the lid, when it was just produced on its own took two hours. Size: Ten centimetres for the height of the container, 6cm across. What we would do differently: Very little. The students concerned meet the brief that they had created and were excited with the results. It was a successful print, allowed for a degree of individualism and created a unique print for the student. The student had not had significant previous experience using Tinkercad but was able to confidently produce the print. (The teacher had to remove the rafting using pliers on this occassion). Challenge: To build a bait station to allow the recording of nocturnal animals. Background: In monitoring the number of nocturnal animals at Auroa Primary School the students from class have identified Cats and Hedgehogs as two animals requiring monitoring. As part of this the challenge has been to 3D Print bait stations (with peanut butter for the Hedgehogs and Cat busicuits for the Cats). Both animals have shown the ability to tip over the exisitng bait stations (as illustrated in the photographs). 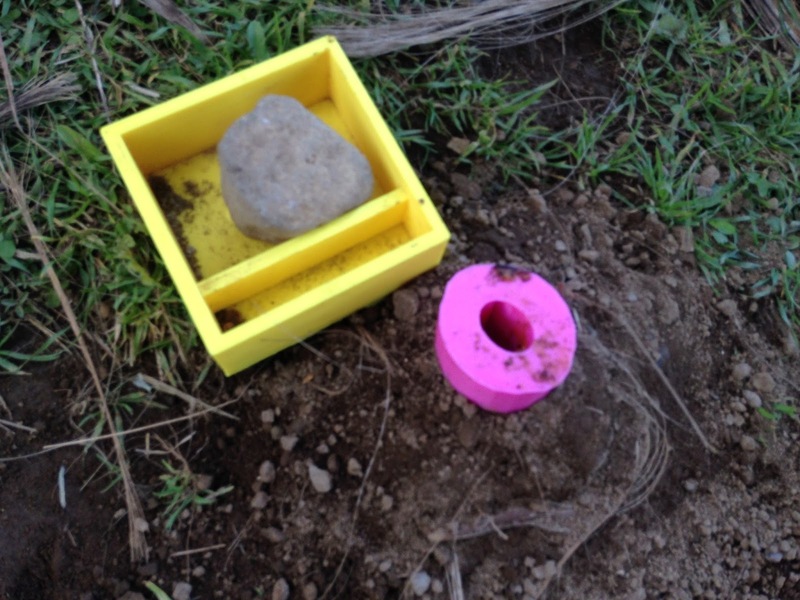 Students have produced bait stations but not currently one that has shown the ability to resist being tipped by a Hedgehog or Cat. Level of Difficulty: Low. 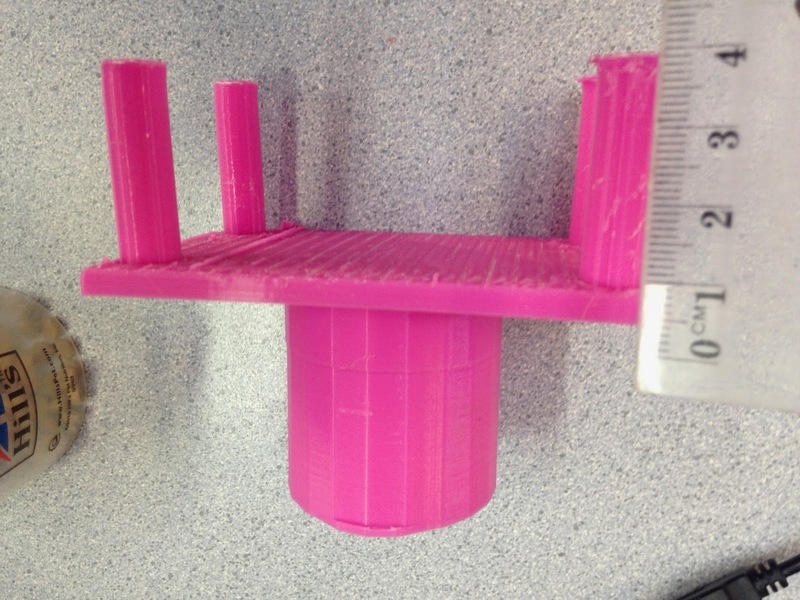 This is a modification of a previous print that has not worked and students are trying to improve the ability of the bait station to avoid being tipped by the animal. Timeframe: Ten hours with a 8mm nozzle print. 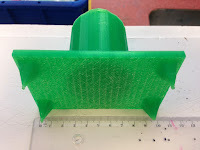 Size: 10cm across, with an 8cm cylnder and then spikes (see picture) designed to a depth of 8cm to provide more stability than the original print. What we would do differently: The spikes, which were intended to provide additional stability, failed. 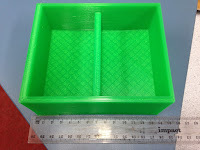 The 'spike design' was not able to be printed correctly, despite several attempts with this version of the bait station. The student has opted to attempt to print a cylinder version of the spikes, and then to bury the entire base of the design in the ground. The idea is that this should provide enough support to prevent the animals from tipping the bait station, allowing them to be successfully photographed. Left: A cat shown tiping the original designed 3D Printed bait station. Right: A hedgehog tipping the bait station at three o'clock in the morning. 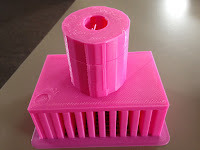 Challenge: For students to create a unique 3D printed bait station. Background: Students are looking to use a tracking camera to record the amount of animals that are located in the school. As part of the process a bait station was required. There are feral cats located in the area, and they were able to wreck the existing bait station. Students working in a group created an original Tinkercad design with the intention of attratcting cats without the cat being able to easily access the bait - allowing the cat to be photographed for recording purposes. Level of Difficulty: Medium, the design was created from scratch and the students involved had previously been creating other designs in the series. This finished version was the first version of the print. The students had access to other students in the classroom who have used the printers. Timeframe: Eight hours on a 8mm nozzle print. The design needed to incorperate several features, a cylinder design to house the bait (in this case, cat bisuits) and a platform with the ability to allow it to be placed in the ground. Size: 10cm across, 6cm high, 5mm across - platform. The cylinder for the bait was 4cm across and 7cm in height. These sizes were worked out on the basis of the problem that the students were looking to solve. What we would do differently: The design currently relies on the weather remaining dry as there is no lid. This is a consideration for an improvement if the weather proves to be wet in the future. The feral cat activity would indicate that the cats are quite vigourous in attempting to access the catfood. There is a significant question about its durability under pressure. Given all the circumstances the students have completed a challenge with a innovative and creative design that specifically addresses an issue that needed to be solved. Left: Actual footage from the first attempt at using the Trail Camera to identify and record feral cats in the school. The yellow box that is in front of the cat has been dragged from the position that it was placed in. This is not a seperate post, it is detailing some of the additional decoration that was added to the Jewllery Box created this week. 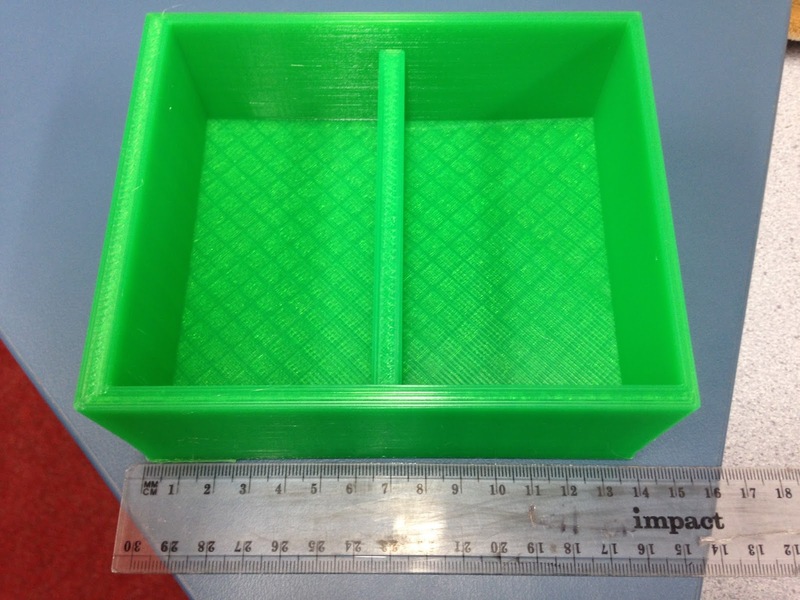 The student who is a Y5 (ten year old) student created the base and the lid in two seperate prints detailed on this site taking twelve hours for the box and eleven hours for the lid. 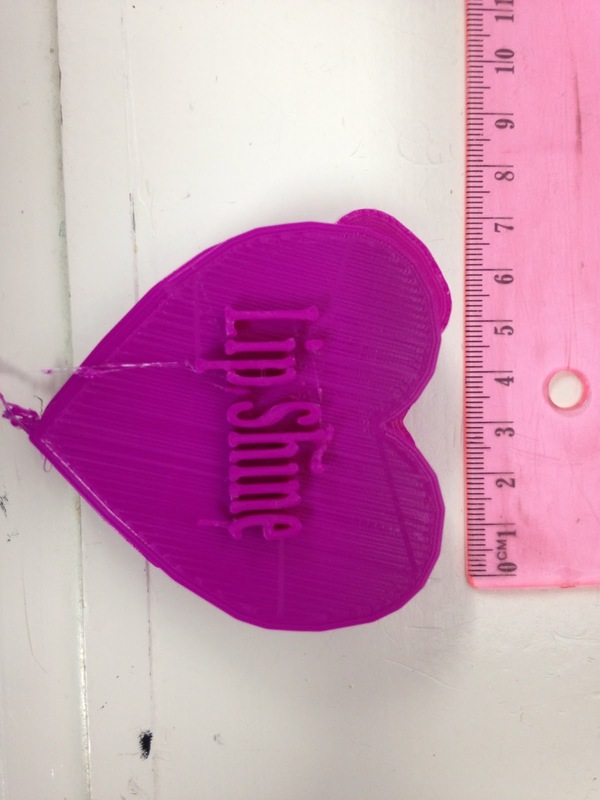 This was the students third attempt at 3D printing. Left: Jewellery box (with rafting removed from under the handle). Student purchased stick on jewellery accessories from a bargain shop ($2) shop. These had adhesive labels which peeled off to allow the decoration to be stuck to the box. The box as noted previously went through six drafts before the final design was completed. Left: Viewed from the other side the box featuring the decoration. The adhesive material on the outside decorations was able to be attatched easily to the printed box. Transparent green was the PLA filament that was used to print with an Ultimaker 2+ with a 8mm nozzle. The combined print time for two seperate pieces was twenty hours. 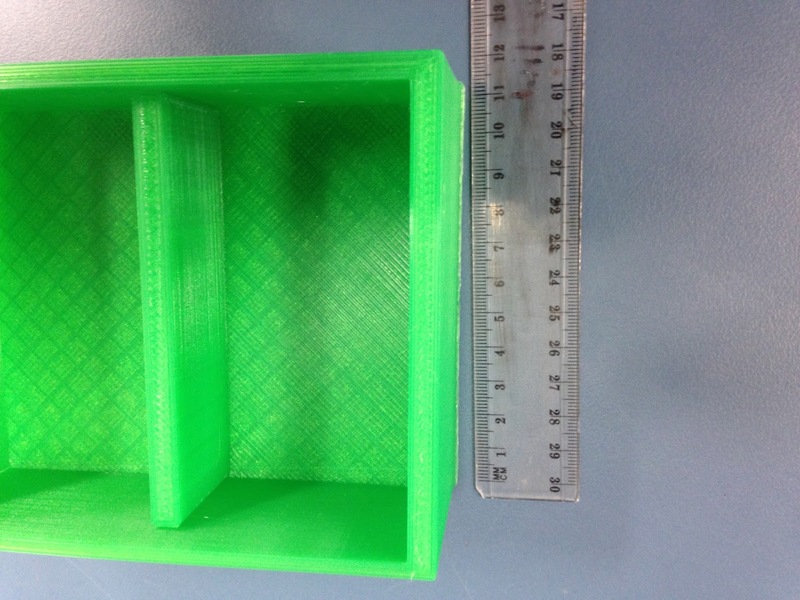 Left: The student wanted to make this box into a functional Jewellery box and to do so decided that padding would be required for the internal part of the box. 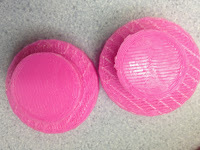 She purchased the padding cheaply from a $2 shop, the right hand side was designed for earings. The left had side was for general jewellery. The lid once 'rafting' was removed was able to sit precisely on the top of the box. Challenge: To produce a working and individualised lid to be used in conjunction with the box designed in the previous print. 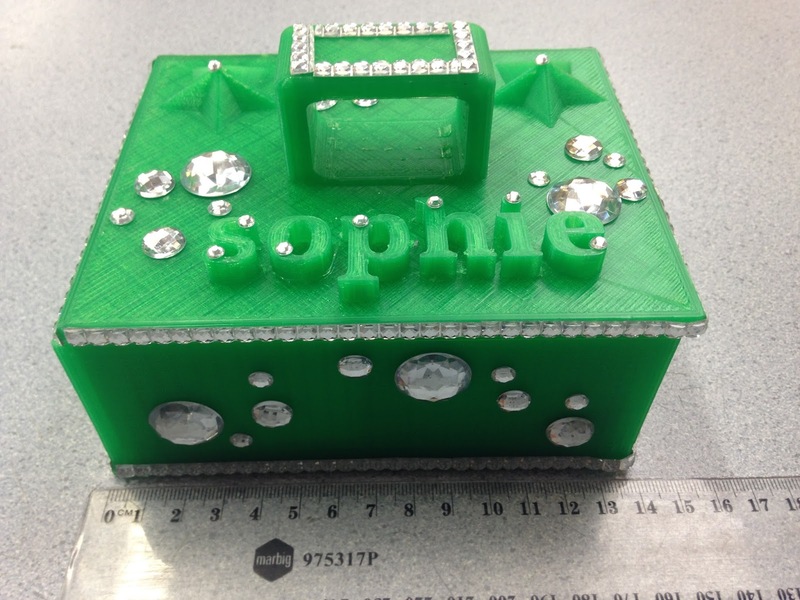 Background: Student was looking to create a jewellery box, individualising it in a way that reflected herself. The lid needed to reflect the dimensions of the box as the two had to work in tandem. 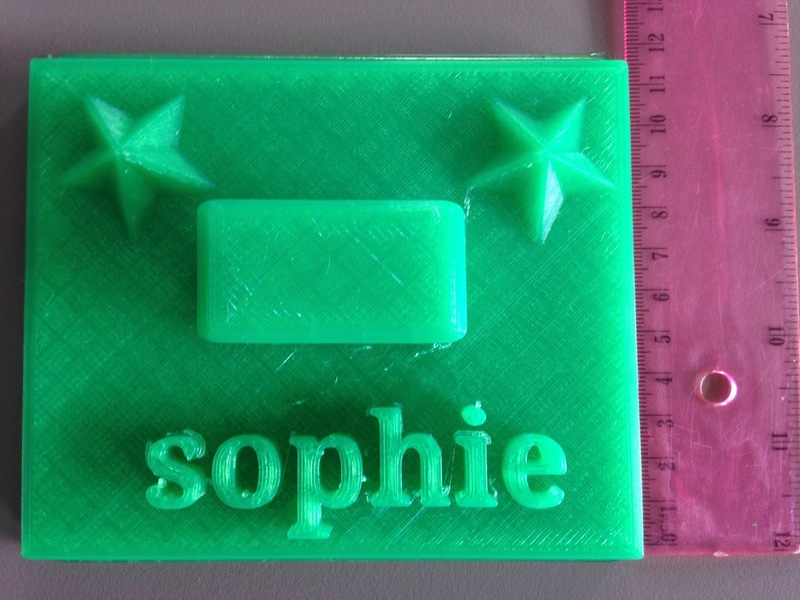 The student concerned with this project is ten years old and its her first mid level difficult project having already completed projects based around a name plate and a desk organiser. Level of Difficulty: Medium - in this example the challenge was not to build simply a standard lid but to ensure that it was personalised for the student, the student opted for her name and a pair of stars visible in the photo. These were both created using the default interface on Tinkercad, and took fifteen minutes to create. Timeframe: Eleven hours, the layering of the detail on the stars and the name lettering ensured that the lid as a seperate piece took nearly as long as the base to produce. 8mm nozzle. Size: 14cm by 11cm with a depth of 1cm. What would we do differently: The lid has some basic edging but does not have the detail or the drop in lip feature of other boxes that have been designed of a similar nature in the class. As a consequence the lid has to sit ontop of the box instead of being held firmly in place as part of the design. The student however was not concerned as given the nature of the print was thrilled with how it turned out. In the photograph above the handle 'rafting' is still in place, and has yet to removed, knocking this through would allow the handle to gripped properly. 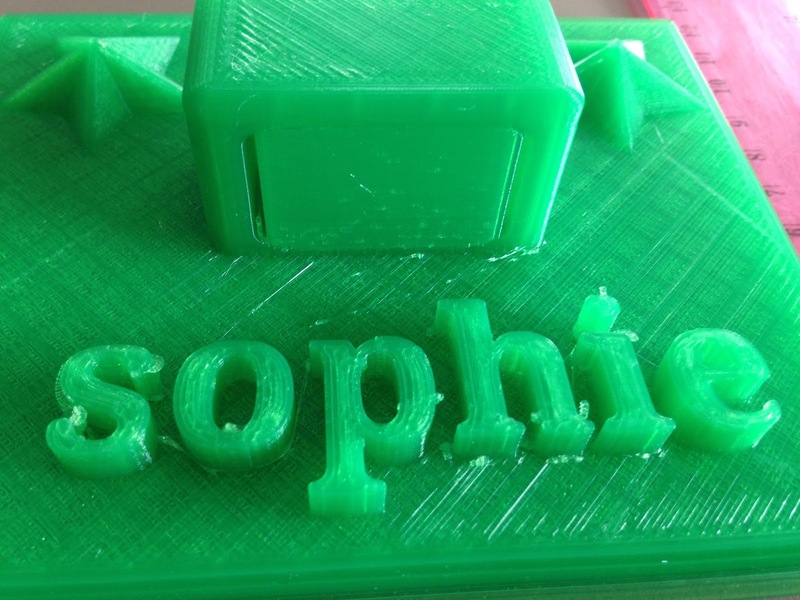 Challenge: For a student to design, from scratch, an original 3D Print of an object that would have a use and a purpose. Design need to be built by the student (using Tinkercad) who was ten years old. Background: A student who had created a name plate, and then a desk organiser was looking to create something else original. 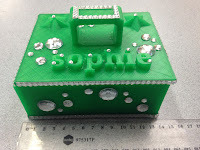 She had seen designs from other students for iPod Boxes and Edison Robot box holders and decided to create something that she could personalise in this case a jewellery box. completed, five of the designs would not have work or the base would not have printed successfully. This was the students first project of a more advanced level. Timeframe: Twelve hours - this is similar to other prints in this series, completed with an 8mm nozzle. Size: 14cm wide, 11cm high and a height of 5cm. What would we do differently: Not a lot. The internal bar between the sections was originally thin but this was picked up in the review of the print. The original design had a print time of a 30 hours however this was because the height was intended to be in the 20cm-30cm range. 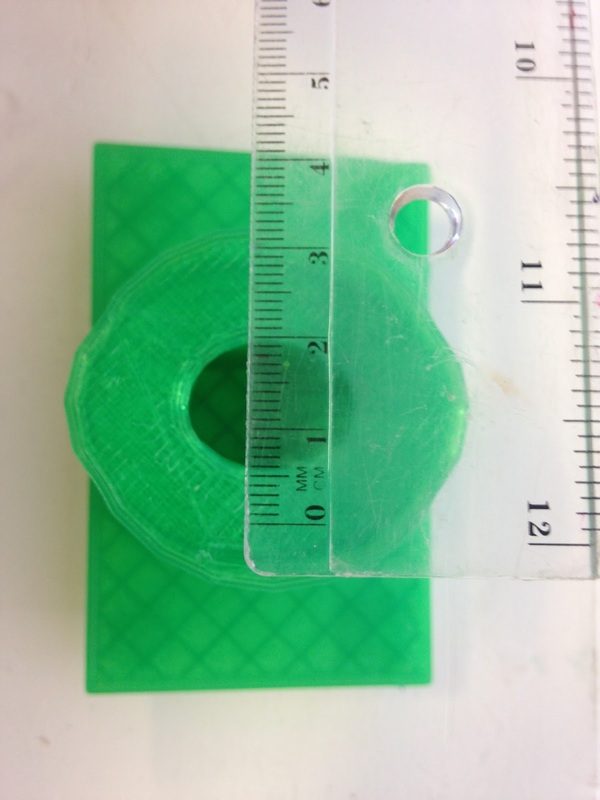 As a result of this and the importing of the print from Tinkercad to Cura to determine the printing time and drawing a mock up of the design, relative to its size. Given that the purpose of the box was intended as a jewellery box this clearly would not have worked - however it was a positive experience for the student to realise and identify this.